Imagine this, You pull your smartphone out of your pocket and unfold it like a napkin into a tablet. You press your finger on the screen, and it unlocks. You switch to the camera app, and a spider-like array of lenses shoot simultaneously to capture one giant photo. These are all things I’ve seen smartphones do — some in prototype form, others in models you can get only in China. But this time around, we are about to witness a smartphone with 9 cameras from Light, according to what Washington post reported. 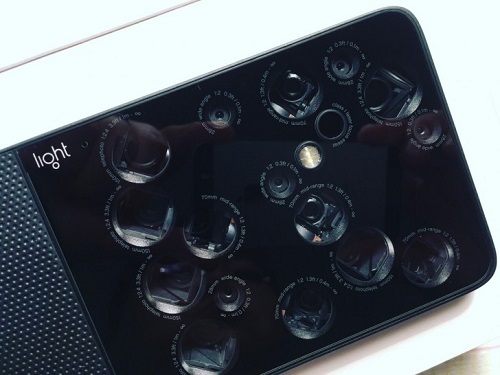 Light is developing a phone with 9 cameras. In case you never heard about Light: it is the brand which released the first computational camera with 16 sensors, called L16. According to the manufacturer, its technology can make cameras shoot photos with resolutions of up to 64 MP. It can achieve good performance even with low-light conditions. Light promises sophisticated depth effects and unmatched zoom capabilities, unrivaled in the smartphone market. Phones like this don’t come cheap even though we don’t know the hardware capabilities yet. The L16 cost $1,950 and we expect the upcoming smartphone with 9 cameras to cost more than that. What would you do with 9 camera smartphone? Not impressed at all maybe because I don’t fancy camera in a phone that much. I haven’t even come to terms with the importance of double rear cameras on phones. Now this ones are talking about 9. Just look at the photo you used prof. I can count 16 lens. Too many cameras makes the phone ugly. They should just focus on making a single camera more powerful and clearer instead of bombarding us with camera all over the place. Is it not still one picture it will take at a time? I don’t find it exciting. Rather, it looks UNINTERESTING and sort of disgusting. heard Nokia has something like this in the works. I hope they can make it look good. What are we going to do with 9 camera smartphone, definitely not looking forward to it. wetin I wan use 9 camera do? Absolutely rubbish. What is the need for 9 cameras while not make Only one. then make the picture Quality very powerful.